The first snow fell on the Swiss alp and the temperature close to freezing temperature. A perfect time for a few whiskies? End of November is always a very busy time of the year, but I managed to free myself for spending a few hours at the Whisky Ship (Whisky Schiff) in Zürich. I attended a few whisky fairs this year and some new ones make their apparition at the end of November, on time for Christmas. 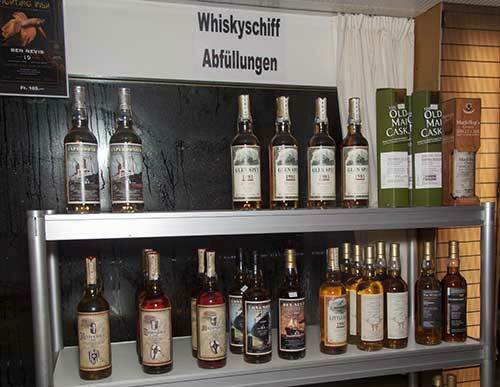 The Whisky Schiff is a very busy event and I hoped that visiting it on a Thursday would be easier to navigate between the stands and having the opportunity of purchasing some of the most interesting bottles. As always, these are my initial impressions made during the Whisky Schiff and the whiskies will be tasted again later in standard conditions. 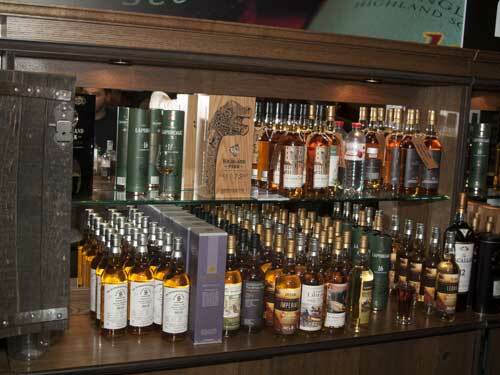 For the Whisky Schiff, several special bottlings were prepared from some retailers. As tend to rush through the stand of Monnier, I decided to start with them. I find the quality of the Caperdonich variable, but I was pleased by the Caperdonich 1994 bottled for Monnier for the Whisky Schiff, well balanced and harmonious, floral, slightly spicy and with a light sweet fruity influence. The Caperdonich fans will certainly like it. The Glen Spey 1981 is a limited edition of 95 bottles for the Whisky Schiff 2015. It was mellow, smooth, malty, with some woodiness, sweet notes of melon, tangerine and honey. The roundness was lovely and this is the most complex Glen Spey I have tried so far. The Littlemill 1988 Kreuzritter for Monnier was a rather spicy Littlemill, slightly sour and on pink grapefruit, while the Littlmill 1990 24 YO Fighting Fish was slightly less citric, rounder and with some honey flavours. My favourite was the Littlemill 1992 Old Passenger Ship, a more classical Littlemill, round, intense, grassy and on honey, with a nice balance. The Glen Garioch 24 YO Fighting Fish from Monnier was very good, aromatic, intense, complex, smooth, well balanced and with a rather strong smoky and peaty influence, that you might still find in Glen Garioch distilled until 1990. The Port Dundas 1978 35 YO Fighting Fish was round, grainy, on orange, with some vegetal and slight rubber flavours. The Oloroso sherry influence is rather dominant. 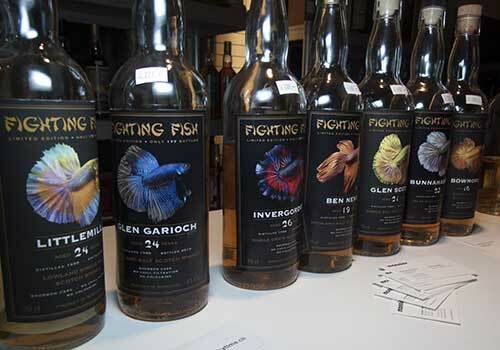 The selection at Monnier was good and diverse, while my first experience of the Fighting Fish whisky range bottled for them was very positive. At Paul Ullrich, I decided to taste two of the recently released Compass Box, starting with the intense, oaky, slightly peaty Flaming Heart. The intensity and wood spices notes surprised me slightly. I was expecting something smoother and rounder. 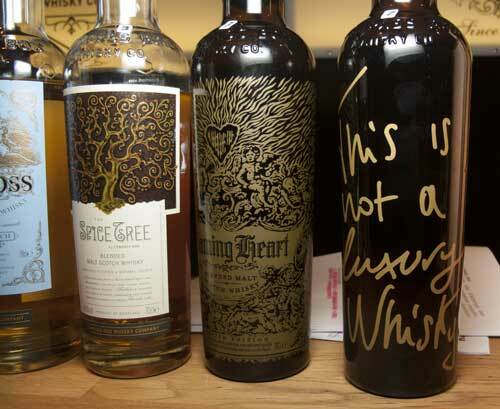 The “This is not a luxury whisky” was a very smooth, slightly floral blended whisky, well balanced and harmonious. Alexander Weine is the importer for the Wolfburn Whisky company, a distillery that started to produce whisky almost 3 years in the North-East of Scotland (in Thurso, Caithness). Harry Tayler, the CEO of the distillery travelled from Scotland to present his new spirit for the Whisky Schiff. As he received the packaging and the labels just before travelling to Switzerland, the bottles were hand-labelled at his hotel for this World Premiere. The spirit was aged 34 months, while the label indicated “Whisky”… As it is less than 3 years of age, it cannot be sold as whisky, but it should to come to age within 2 months! The production is unpeated barley, but since 2014 a small production of peated barley (10 ppm) was started and following a positive feedback from the customers, the amount of peated distillate increased in 2015 and will continue over time. Maturation takes place in ex-bourbon or ex-sherry casks, with the plan to sell the sherry casks, as single casks and at cask strength. For this 34 months release, the maturation took place in quarter casks, with most of the whisky matured in standard barrels. The spirit was surprisingly matured, rich and spicy, without the new-make like flavours present in most very young whiskies. A good surprise. I am looking forward following the produce from the distillery producing approximately 110,000 LPA. 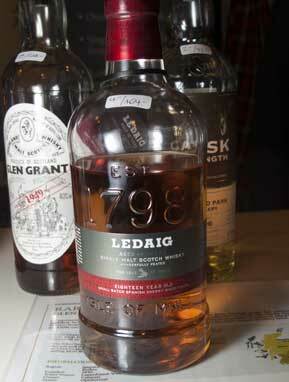 At Best Taste Trading, I tasted the new batch of Ledaig 18 YO, OB, finish in Spanish sherry wood. This was a lovely peated whisky, salty, with a smooth and round sherry influence, some tar and ashes. Well balanced and very good. The quality of the Ledaig since a few years is very good, and this one is no exception. Acla-da-Fans have released a new North of Ireland (Bushmills) 27 YO jointly with the Whisky Agency. The result is an excellent bourbon-matured Irish Single malt, very smooth, round and slightly oily, with rich and intense sweet fruity notes (cooked fruits from the Orchards, some melon and diverse berries), well balanced and with a long pleasant mouth feel. The last bottles sold out before I left. For the Whisky Schiff 2015, the Glen Moray 1988 was again a joint bottling between Acla Selection and The Whisky Agency. 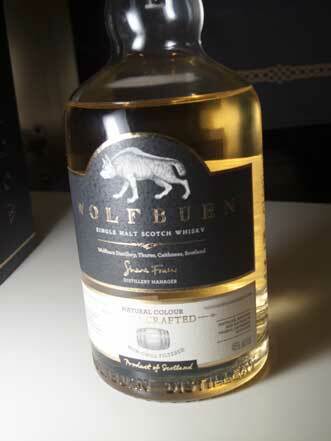 The whisky was mellow, very smooth, malty, with nice sweet, rich and sugary fruity flavours fading rapidly. The Imperial 1995 Signatory for Acla Selection was a nice fruity, floral and complex whisky, with diverse spices, a good intensity and some round fruity flavours. A well made Imperial. The Tullamore Dew 12 YO Single Malt Sherry Cask Finish for Travel Retail is a very smooth, rich, Irish single malt with some green spices, vanilla, some tangerine and orange. Very good. At 42 CHF the 1 L, this is one of the best value malt that I have seen for a long time. Highly recommended. The Invergordon 30 YO Circus is one of the latest bottling from The Whisky Agency. It is fresh, intense, slightly oily, smooth, with nice sweet fruity flavours of apricots, peach, tangerine, orange and leather. One of the nicest sherried matured grain whisky I have tasted. The Macallan Rare Cask Black is a Travel Retail version of the Rare Cask, with a heavier sherry influence and quite some rubber. The rubbery influence is too strong to my liking and the mouth feel is rather thick and syrupy. My best whisky of the evening was the Legendary Linkwood 1957 56.9% OB bottled for Samaroli and Giaconne, with a perfect combination of smoothness, fruitiness, complexity, sherry influence and a lovely peat smoke. The Connemara Peated 22 YO OB was moderately peated, mellow and smooth Irish whisk(e)y, with a light seabreeze and slightly weak. The new Highland Park Thorfinn had just arrived. I will taste it later, but this is the newest addition to the Warrior serie and the most expensive as well. The Glenfarclas 1996 Oloroso Sherry Cask for Germany was vegetal, round and rubbery. Not a whisky for me. Sorry. The Mortlach Special Strength OB for Travel Retail was a very pleasant Mortlach, round, spicy to very spicy, complex, with a nice sherry influence, without being rubbery. The flavour profile reminded me of the old Mortlach 16 YO Fauna and Floral, with a slightly lower sherry influence but with more intensity and slightly less complexity. The Talisker Dark Storm For Travel Retail is a rather smoky expression of Talisker, with a pronouced influence for the deep charred casks and on burnt sugar. A rather different expression from the 10 YO, smokier but less peaty and I could not really feel the peppery flavours. The Laphroaig 16 YO for the Whisky Fair 2015 was a very nice smooth, peaty, smoky and maritime Laphroaig, with a rich sweet influence from the sherry cask. Very good. By comparison, the Lahproaig 16 YO, OB, 43% just released for the Travel Retail, was less intense, cleaner, mellower and softer, rather smoky, with some light sweet fruity flavours of yellow fruits. Good. The number of new Travel Retails expression is rather impresive and of variable quality, but generally rather pricey. Acla da Fans is a rather unique shop, as it is located in a small duty free zone in Switzerland and thus can have access to the travel retails products. 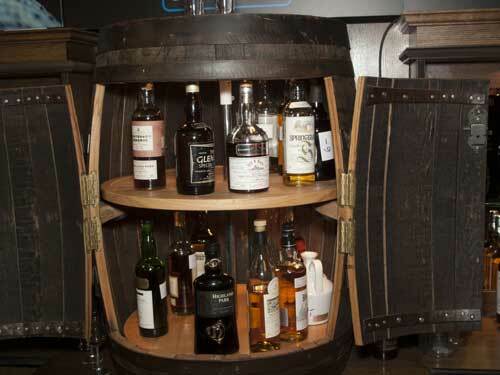 After tasting the new products, it was time to give a taste to the "Fass", the famous shelve made from a cask, where all rarities are kept. The Highland Park 1972 24 YO from the Bottlers was a most pleasant Highland Park, slightly smoky and peaty, on heather honey and pleasant sweet juicy influence from a refill sherry cask, with well balanced flavours. Harmonious and very good. The Highland Park 1970 Centenary from Gordon & MacPhail was slightly less intense, with a very fruity (orange and tangerin) influence of the sherry. Although it is very dark in colour, the sherry influence was sweet and any bitter or rubbery flavours. More on the red berries than the 1972 The Bottlers, but very good as well. Talking about Dark Sherry, I had also some concerns abou the Port Ellen 1982 25 YO Douglas Laing Platinum for the Pot Still Austria. As for the Highland Park, I was pleasantly surprised to taste a smooth sherried Port Ellen, on toffee, treacle and chocolate mousse, on berries and orange, with a moderated peatiness. Very round. It is always to have the opportunity of tasting a Port Ellen, as they become increasingly rarer and more expensive. The Glen Garioch 21 YO Limited Edition OB was round, aromatic, rather heavy and spicy, on ginger, some humus, as well as with some tangerine, a slight fragrance and smokiness. The Bowmore 15 YO, OB, in a white decanter (same vintage as the Glasgow Garden Festival of 1988? ), was very round, slightly soapy and fragrant, with a rather dominating sherry influence, and very little smoky influence. I have tasted better Bowmore so far. In terms of stands visited, I only visited a third of them in 4 hours. There was plenty of other products that I wanted to taste, for example the new Ballechin 11 YO Cask Strength or the Glenlivet 1974 41 YO from Signatory for Waldhaus am See. As most of them will be present at the Whsiyk Schiff Lucerne (Luzern) early next year, I will try to visit them more into details then. As always, the ships are very busy, even at 18h15 when I arrived. At such events, the earlier you come, the better it is. I wish they could add 1 or 2 additional ships in order to facility the movements between the stands, as you might need to wait 10 minutes in order to gain an access to the bar to order your glass. As you pay per glass, the choice of whiskies is very large and includes a nice selection of rarities, mainly at Monnier and Acla Da Fans. As a slight disappointment, none of the Diageo Special Releases 2015 were available for tasting. I enjoyed very much my visit and my discussions with whisky enthusiasts (sometimes not long enough). See you next year!